Are you looking for the perfect First Bear for a special newborn baby? Why don't you shop our timeless Paddington Bear, a gorgeous edition of the world's most beloved teddy which is perfectly safe and suitable for the little one! Although new baby clothes or activities are fantastic presents for the baby boy or girl, you can't beat providing them with a new companion to provide comfort through the first stages of their life! A teddy will accompany them everywhere and they'll soon be inseparable, so you're giving them such an important and memorable keepsake. Alongside Beatrix Potter's Peter Rabbit, fictional character Paddington Bear is one of Britain's most popular and important children's figures! Created in the 1950s, he's an inspiring, friendly and lovable bear who has been on thousands of wonderful journeys through memorable literature, television and film. Providing our 'My First Paddington Bear' as the little one's new teddy is a fantastic way to introduce the baby to an important character, and spark a love of reading! To ensure the safety of the baby, this version includes all of Paddington's important features but especially suitable for a child. This means the teddy is the highest-quality velour and cotton! 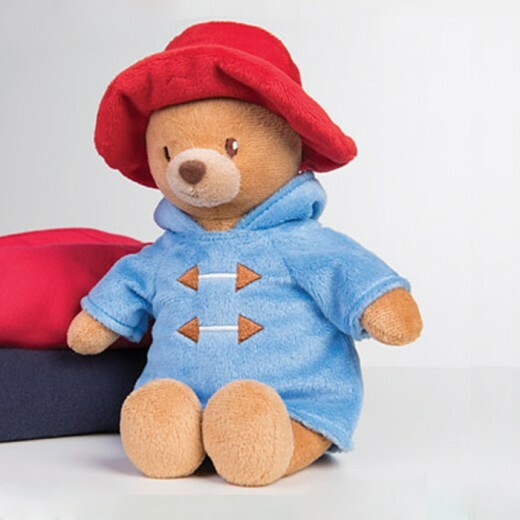 Wearing a brightly coloured red hat and blue duffle coat, he is perfectly soft and secure. Measuring 20cm, he is perfect in every way! Perfect for the anticipated baby's arrival as a Baby Shower gift or for sending directly to the hospital, it is affordable yet special and will be treasured for many years to come.